Eileen and I don’t get out much, with all that’s going on. 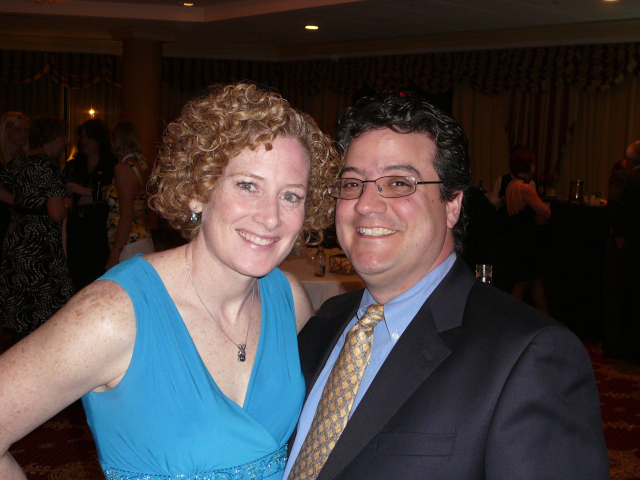 So, we finally did get out and went to the St. Mary’s Fundraiser in Springfield last month. They do a silent auction and have a night of drinking and dancing, a really fun time! This year, we managed to win some nice gift certificates and a TON of cool toys (enough to last us for birthdays and even x-mas!). Our friend Joyce took a nice picture of us… here it is! Love the pic. Eileen looks BEAUTIFUL. And you with that silly, ‘I’m-up-to-no-good’ grin. You’ve had that same smile your whole life. I crack up every time I see it!